The Sony LCJ-RXB/B Leather Jacket Case is a form-fitting genuine leather case for the Sony Cyber-shot RX compact digital camera. This case attaches to the bottom of the camera via the tripod socket and offer protection from dust and scratches. It also features a built-in 1/4" socket for use on a tripod without having to remove the case. Box Dimensions (LxWxH) 6.3 x 4.5 x 4.5"
LCJ-RXB/B Leather Jacket Case is rated 3.4 out of 5 by 5. Rated 1 out of 5 by John Rausch from Good Workmanship, But Not Useful This case is very nicely made, but it is pretty much useless as a carry-around case. Made for tranport, removing the entire thing when you want to use the camera, but that's about it. It consists of two parts, a shell attaches to the RX1 via the tripod mount on the bottom. The knob to fix the shell to the RX1 is about the size of a nickel and about 3/16 thick. This makes it impossible to set the RX1 level with the shell attached. This could have been a recessed, fold-down leaf-type thumb screw that would have been even with the bottom of the shell. The protective cover wraps around the RX1 and shell and snaps to itself on the bottom. It is not only awkward to remove, but once you do, you have to put it somewhere -- it is completely detached from the RX1 and shell. This part of the case should have a snap, or something, on the bottom so it could remain attached or be completely removed. Finally, if you are going to use a case such as this, it should function as a case where one unspnaps the cover, conveniently takes photos and then snaps it back. This case has no purpose. Rated 1 out of 5 by cmyk from Battery compartment lid wears out quickly For $249 this luxury item doesn't last. Mine lasted about 1.5 months. The closing mechanism of the battery compartment lid is made of cheap plastic. It wears out quickly. And eventually does not keep closed anymore. Rated 5 out of 5 by Photogdog from Good Addition for RX 1 I bought this after purchasing my Sony RX 1. Given the price, a leather jacket is cheap insurance. Rated 5 out of 5 by kohnforsho from Great fit and look Great leather case due to it's super tight fit and sharp looks. Rated 5 out of 5 by Steve from Excellent case, if you know Why and How to use it. Here is why I bought this case and how do I use it. First of all the no.1 purpose of this case is camera protection and also improved grip. The bottom side of this case provides both while the cover just protects camera in a transport including having is on your shoulder or hanging off your neck. I love to hold this camera with lower part of the case attached, it creates full body camera grip experience without compromising its convenient smaller size. The attaching bolt size and shape is exactly what it needs to be to enable easy attachment and removal without using any tools neither coin, just twisting with your fingers is well enough to get the case in and out of the camera even on the go. The base creates perfect protection for lower parts of the camera including those edges who often get beaten up more on the field. Overall nothing but benefits in this case. The main top shell is removable and yes, you need to put it away when not on the camera. But thanks for the snap pin lock you can easily wrap this around your belt and have it with you all the time without a need to hold additional bag. The case is built well, sturdy and will protect your camera even when dropped. This is because the case has reinforced edges all around so nothing gets pushed in. The case interior is soft plushy surface with lots of cushion to ensure your camera gets best treatment when stored in it with absolutely no risk of scratching, tearing or else. Some reviews bash this case and that is because buyers have no clue how to use it properly but most of all, they have no clue of the purpose of the jacket type case for the camera. This goes back to past century 60 and 70's era where those type of cases were very popular and when cheap plastic backpacks and shoulder strapped mini bags were for some poor chaps, not someone who can afford expensive rangefinder camera like Sony RX1 models. Highly recommended. Does it fit RX1r II? Sony does not list this case as compatible with the RX 1R II. 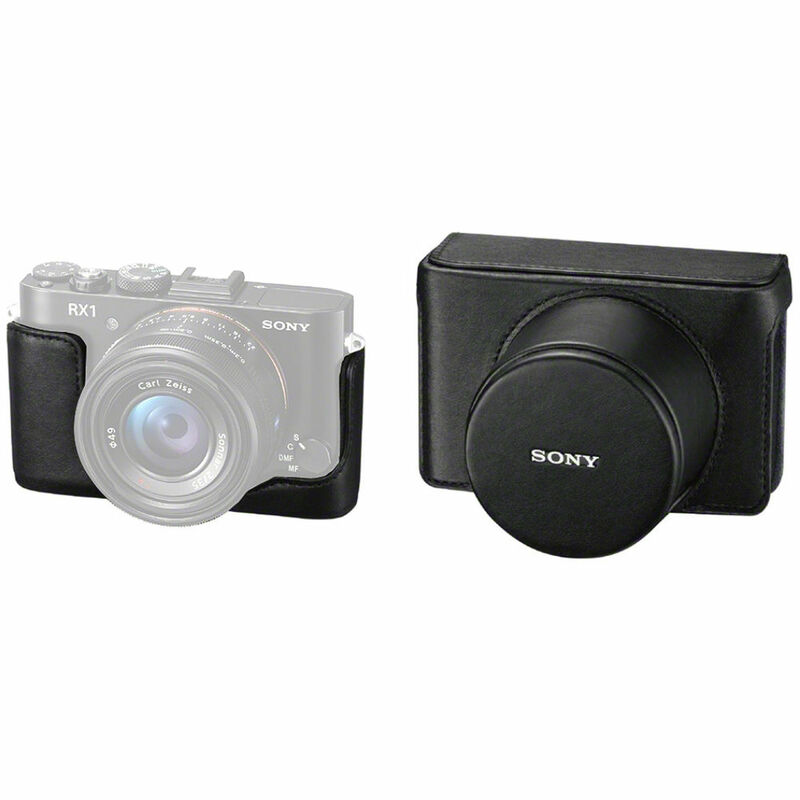 The case that they do list as compatible is the Sony LCJ-RXH Jacket Case for DSCRX1 Camera Series (Black) B&amp;H # SOLCJRXH. Please see the image below for reference.